When people think of the Jurassic Period, which occurred between 200 million and 145 million years ago, they often think of dinosaurs and they should. After all, this time period was the Age of the Dinosaurs. However, dinosaurs weren’t the only creatures which evolved, thrived and lived or died at this point on the geological time scale. Other creatures would continue to evolve and those which didn’t go extinct would enter the next period ready to compete. By the time this period had started, the supercontinent Pangaea had already begun splitting itself into two separate supercontinents – one to the north and one to the south. The southern one was named Gondwana and the northern one was named Laurasia. The effect this split had on terrestrial life was nothing short of amazing. 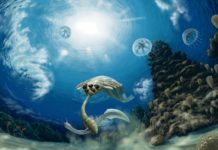 With two supercontinents, instead of one, there were more coastlines on which life could evolve. It also made the interior of the continents more humid and far less arid. This allowed the dominant animals to shift from crocodylomorph and dinosauromorph archosaurs to dinosaurs alone. Dinosaurs weren’t the only animals to dominate land, sea, and air, however. A branch of theropod dinosaurs would evolve into the first birds. Plant life also diversified with conifers, ginkgoes, ferns, cycads and bennettitaleans extending their reach. 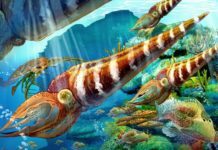 And the oceans were filled with ichthyosaurs, ammonites, and cephalopods. And early mammals, no bigger than rats, made their first appearance but they would have to wait for the extinction of the dinosaurs at the end of this period and the beginning of the next one before they could get a good ecological foothold. Ultimately, dinosaurs would become what the Jurassic Period was known for and rightly so. Reptiles during this time had managed to overcome the problems that had kept amphibians from developing strong ecological strongholds that would allow them to dominate. Reptiles had advanced muscular groups that worked ossified skeletons and they were able to lay amniotic eggs. This allowed them to live on land exclusively and not have to split their time between a terrestrial existence and a marine one. Sauropods were some of the large dinosaurs which dominated this period of time. They had long necks that were balanced by long tails and were plant-eating quadrupeds. Some of these grew to enormous size, as well. Especially Brachiosaurus, which could be over 100 feet high and weigh in excess of 100 tons. These animals were quite successful as well. In fact, they can be found on every continent – with the exception of Antarctica. 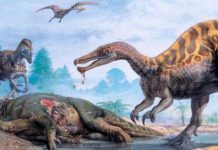 The relatively peaceful herbivores had to compete with the meat-eating dinosaurs – mainly, creatures such as Carnosaurus, Allosaurus and the later evolving Tyrannosaurus Rex. Most of the large carnivorous dinosaurs fed off of the herbivores, but some like Allosaurus probably didn’t try to take on Stegosaurus or Brachiosaurus. These herbivores were way too large. They probably had to prey on the young, the sick or the infirm members of these large species. 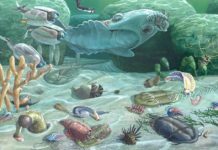 The oceans of the Jurassic Period were dominated by a variety of marine reptiles and fish. These included Pliosaurs, Plesiosaurs, Metriorhynchidae and Teleosauridae. These weren’t the only marine animals, however. There were also rudists, belemnites and Gastrochaenolites. A number of turtles lived in the lakes and rivers of this time. These included Australochelys, Condorchelys, Eileanchelys, Kayentachelys and Bashuchelys. A number of conifers existed and flourished during this time. Some of the more common ones include Taxodiaceae, Araucariaceae, Podocarpaceae, Cephalotaxaceae, and Pinaceae. Tree ferns, ginkgos, and palm trees were also common during this Jurassic Period. A variety of mammals existed during this period, but they all remained small. 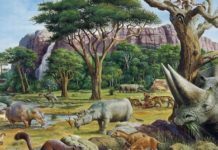 Some of the mammals that lived during this time include Brancatherulum, Castorocauda, Hadrocodium, Docodontidae, Pseudotribos, Shuotherium, Sineleutherus, Volaticotherium, Amphilestes, Kuehneodon, Plesiochoffatia, Docodon, Fruitafossor, Tinodontidae, Docodontidae and Juramaia. 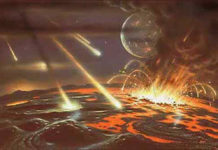 The end of this period was marked by the Jurassic-Cretaceous Extinction Event. This extinction event killed off some of the dinosaurs and quite a few other species at the time. However, it’s only considered to be a minor extinction event. It opened up ecological niches that allowed a number of species to flourish in the Cretaceous Period.